If your stair is walled off on both sides, you may opt for a simple straight timber handrail the length of each flight. 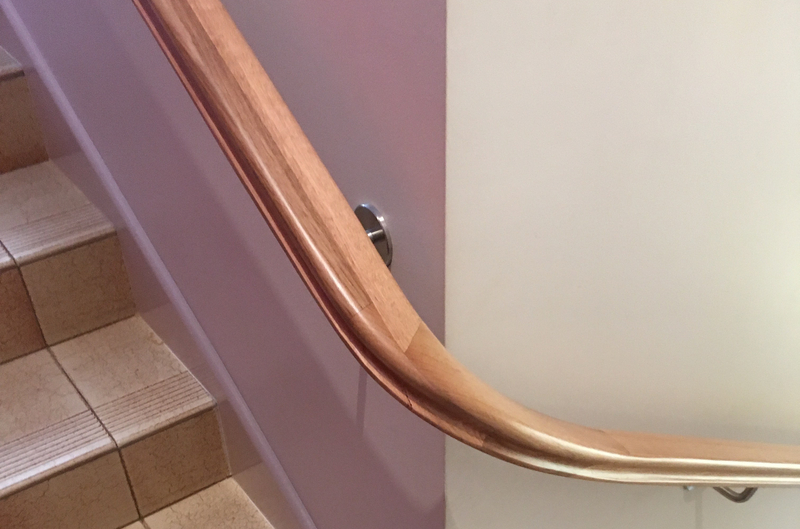 If you have timber treads on your stair, most people will choose to match the handrail timber accordingly or alternatively they might opt for a modern stainless steel look handrail instead. The shape of your timber hand rail is entirely up to you, depending on the style of your home you may opt for a custom made continuous handrail which carries on the full height of the stair also curving around the landing. These look absolutely stunning, particularly when paired with a timber stair case. A straight 50mm round the length of each stair flight is probably the most common handrail type we do, it is comfortable to grip and also the most cost effective option. Traditional keyhole shape is also available and both these types can be custom made in the timber of your choice. When your stair is open to one or both sides, along with your handrail you must also have balustrading to prevent falls and comply with safety regulations. Balustrading may be made from a variety of materials such as mesh, timber, glass or metal. The distance between your balustrades must also be compliant with Australian Building Regulations, so when you are browsing internet photo sharing websites for inspiration keep in mind that some images may be from overseas and subject to different rules. Your joiner will be able to advise you on how to create the look you want and stay safety compliant! The owners of this beautiful stair above have opted for a curved handrail and turned feature posts in the timber “Cambia” to match their stair treads, with riser boards and turned balustrades painted a contrasting white creating an elegant, traditional style. Wrought iron may have lost popularity over the last decade, but it’s elegant look still withstands the test of time creating an air of sophistication and beauty. A combination of glass and timber balustrades on this open tread stair comes together to create a stylish modern feature in the home.